For anyone visiting the Bulgarian capital of Sofia who is into their history and culture, heading to the Cathedral Saint Alexandar Nevski is an absolute must. This iconic building is one of the city’s most recognisable landmarks and ranks among its biggest tourist attractions – and for good reason. Built as a Bulgarian Orthodox place of worship in a Neo-Byzantine style, its construction began back in 1882 as a way of honouring the 200,000 Russian, Ukrainian, Belorussian and Bulgarian soldiers who died during the Russo-Turkish War of 1877-78 as they liberated Bulgaria from Ottoman rule. 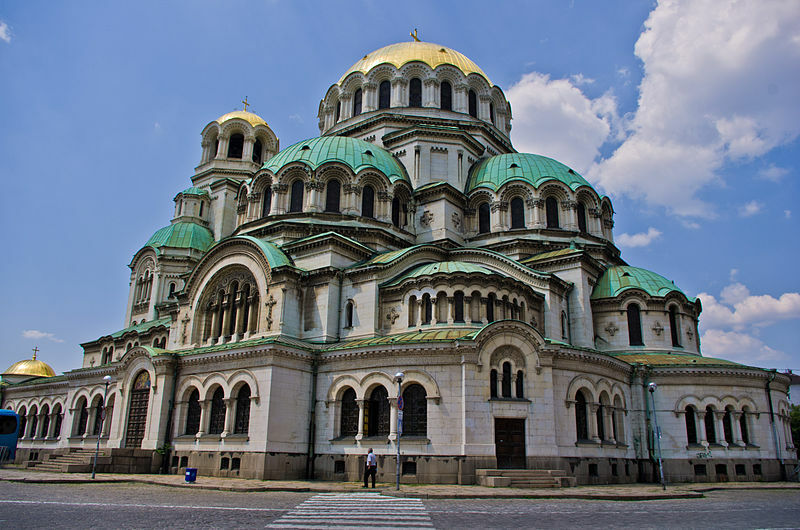 Now the cathedral church of the Patriarch of Bulgaria, it is one of the biggest Eastern Orthodox cathedrals in the world and presents some fantastic photo opportunities for tourists. Notable highlights include the 12 bells hanging from the belfry, which weigh a collective 23 tons. The heaviest tips the scales at 12 tons on its own, while the lightest still comes in at a respectable 10kg. Inside, the decorations are luxurious but not gaudy, with a range of materials having been used to ensure an air of sophistication worthy of a place of worship. Those with an eye for architecture will be able to spot Italian marble, onyx from Brazil and a host of other components. There are also some truly stunning murals within the church, including one depicting the Day of Judgment from the bible’s book of Revelation that is sure to leave onlookers spellbound. However, the most eye-catching design feature is surely on the outside of the Cathedral Saint Alexandar Nevski in the form of spectacular golden domes decorated with gold leaf. These were donated from Russia in 1960 and continue to be maintained for maximum effect today. Indeed, they were recently regilded by a team of expert artisans. If you are visiting the cathedral, don’t miss the chance to go into the crypt below it, which has its own entrance and contains a miniature museum of icons. There is even a rib bone belonging to Alexandar Nevski, among the more macabre artefacts. Estimates for the number of people the cathedral can hold vary between 7,000 and 10,000, but you shouldn’t find it overwhelmingly busy at any one time, so take a camera and leave at least an hour or two to wander around and take it all in. You can easily find the building in the centre of Sofia, just off Shipka Street and within close proximity to a number of Sofia hotels. There are also a number of other landmarks close by, including the National Gallery of Foreign Art, the Bulgarian Parliament and the Monument to the Unknown Soldier.